20 • RV PRO • November 2018 rv-pro.com O P E N H O U S E C O V E R A G E REV Group American Dream 42B The American Dream is back! Technically, REV Group's American Coach luxury diesel pusher line didn't go away, but a previous version of the Amer- ican Dream was de-contented to bring the price point down, according to Dave Denarola, account rep for high-end diesels with REV Group. For 2019, REV has completely redesigned the American Dream with all of the features RVers would expect in a best-in-class diesel pusher, he says. Luxury is on full display upon entering the coach, as evi- denced in part by the Dorian Grey custom hardwood, the detailed crown molding, the recessed ceiling treatment, the gray-white porcelain tile floors and luxury Apex furniture that is exclusive to REV Group. The 42-foot, 11.5-inch-long American Dream features a full-wall slide on the driver's side that encompasses a 77-inch sofa, a Sony 49-inch LED TV on a televator, a residen- tial-style refrigerator and stainless-steel appliances in the galley area and a Sony 43-inch LED TV and washer/dryer in the rear bedroom. A good-sized slide at the front of the passenger side holds a 60-inch jackknife sofa and a pull-out table and two wood- frame chairs. A second slide in the rear bedroom includes the articulating king-size bed with memory foam mattress. There is a half-bath located mid-coach and a full bath with a full tile shower featuring a teak bench located toward the back of the coach. The 42B model toured by RV PRO featured bunk beds at the rear of the coach, which can be converted to extra storage space when not in use. A Sony 43-inch LED TV in the front overhead section of the coach is available as an option, while an exterior entertainment package complete with a Sony 48-inch LED TV comes standard. Sliding doors located at the front of the bedroom and master bath can section off the coach or can remain open to give the American Dream a spacious feel. The American Dream is equipped with an Aqua-Hot 450D heating system and it features heated tile flooring throughout the coach. It also comes with a 15,000-BTU A/C and rear heat pump. Notably, the American Dream is built on American Coach's custom-built Liberty Bridge, which sits atop a Freightliner chassis, providing substantial pass-through storage space. 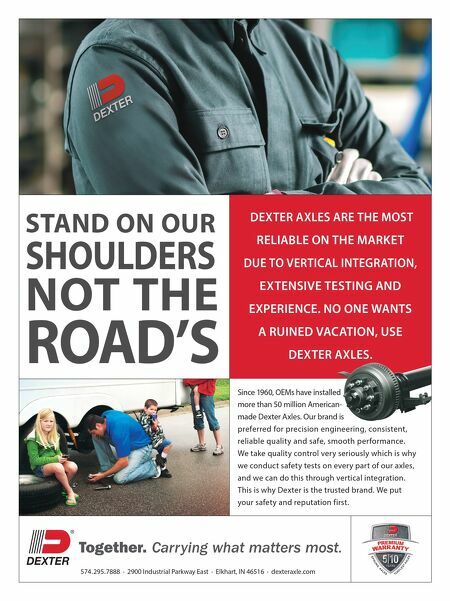 The coach comes standard with an independent front suspension, Mobileye's advanced collision avoidance system and Freight- liner's Select Drive with Ultra Steer system, a passive steering system designed to improve driving performance and reduce driver fatigue over extended road trips. Notable exterior features include front and rear fiberglass caps, four-color premier full-body paint with a front clear mask, a roof-mounted electric patio awning with LED lighting, four- point fully automatic hydraulic leveling jacks and large tinted frameless windows. It also comes with a 2,800-watt inverter, a 10-kilowatt generator and eight AGM batteries. The MSRP for the American Coach 42B starts at $516,000. 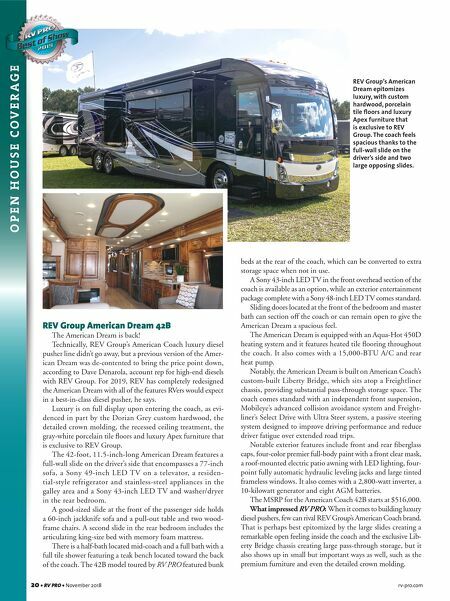 What impressed RV PRO: When it comes to building luxury diesel pushers, few can rival REV Group's American Coach brand. That is perhaps best epitomized by the large slides creating a remarkable open feeling inside the coach and the exclusive Lib- erty Bridge chassis creating large pass-through storage, but it also shows up in small but important ways as well, such as the premium furniture and even the detailed crown molding. REV Group's American Dream epitomizes luxury, with custom hardwood, porcelain tile floors and luxury Apex furniture that is exclusive to REV Group. The coach feels spacious thanks to the full-wall slide on the driver's side and two large opposing slides.